Well I was blog hopping the other night, taking some time away from painting, and, I saw a challenge I really wanted to join in on. Over at Gingersnap Creations they have an inchie challenge with no other set rules other than to make something with inchies. Well I looked at some really great creations that other members had made from cubes, cards and other things and I wanted to do something a little different. Here I have made 3 inchie houses, yes I said houses. I was intrigued last year in a group I was in that they were showing these inchie houses and were going to swap them but for some reason I couldn't participate. Well I downloaded the template and it wasn't quite working for me with all the adjustments and what have you so I basically started from scratch and took the cube inchie and re-designed it and tweaked it a bit. 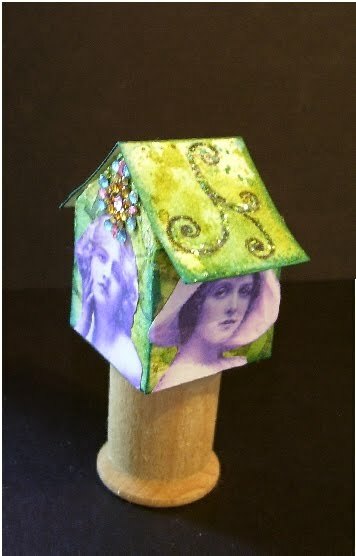 So here you will see some examples of my inchie houses and I hope the gals over at Gingersnap Creations will like them. These are fun and something you could really get into. 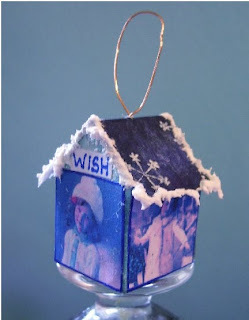 I made the one house an ornament and will hang it on my tree at Christmas time. These would be fun to swap in groups or give as little gifties to teachers or someone who might have a small tree to decorate. The Hallowe'en house was very different for me to do as I don't generally do Hallowe'en but I had too many ideas floating around. 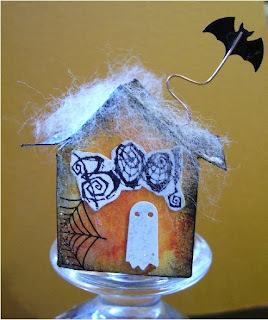 Hubby even added in an idea by putting the bat on a wire suspended about the roof, how cute is that? Thanks Honbun! 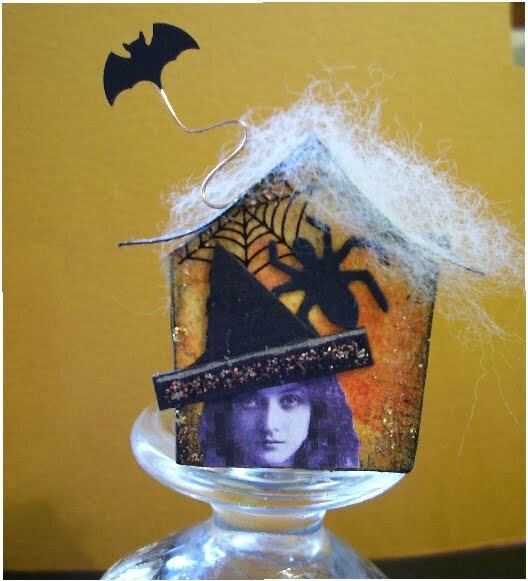 I received some goodies in a swap last year and almost forgot about the little bats, spiderweb stickers and other items til I found the matchbox that they were contained in. So here you go, I hope you like these little houses, they sure were a lot of fun to make. Here is the backside of the house and sorry you can see the wire on the bat but I only had 2 bats and the other one is on one side of the house. This was the first house I made and I used Peeled Paint and Broken China distress inks. Stamped on the paper after it was dry with Broken China and some flourishes. (Sorry about the spools, I didn't have anything else to prop them up on for the pics. )This is the front of the house and I have various other women on all 4 sides. These were all made inchie size but I cut the women out because the base of the cube minus the roof part is one inch square (inchie size). 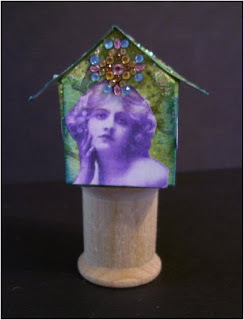 I added lots of Stickles for bling, love that stuff. I have a new colour to play with Lime Ice Stickles, ooo love my greens. All girls were left on their inchies and I applied them to the base of the scrapbook paper I used which was a lovely wintery blue. The roof is paper I did the brayer technique using acrylics and metallic acrylics and glitter. And the snow is Aleene's glitter snow but I added a bit more glitter to make it really sparkle when the litghts hit it. I think I have to make more of these for Christmas, the snow just makes it. I think some Vintage Santas would look really cute on some of these. oh Les, these are just divine! i was suprised to see the halloween one, im glad you made it and hubs idea was wonderful. they are so fun. I thought the cotton reels were a great idea to display them, why dont you cover or paint them to match? 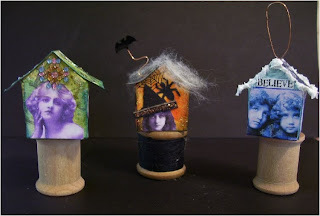 Wow those are sooo cute Les.. great job on them..love the little halloween one..and what a great idea John had.. The houses are gorgeous ! I love your work ! Awwww your little houses are sooo cute Les! Wow, wow, wow! I saw these as Ginger Gems - congratulations! I have been looking at each and every detail, and I am enthralled. These are so creative, so delightful, so beautiful. I love how they each have their own personalities and themes - well, I love everything about them. TFS!